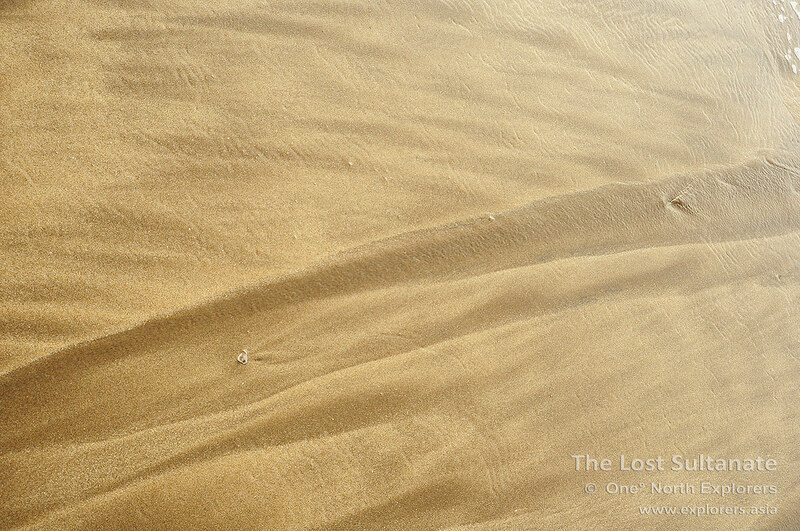 This memoir is a continuation of our last post - The Lost Sultanate of Bantam. Departing the town of Banten Lama, we headed west towards the direction of Anyer, a idyllic beach town where the Great Post Road starts in the west of Java. 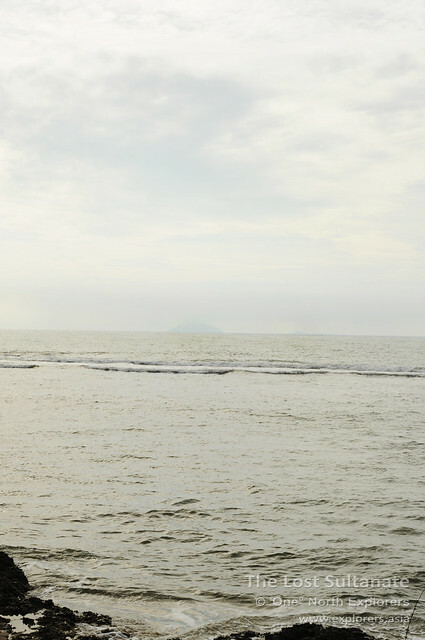 Home to an iconic lighthouse which we planned to visit, the beach is also one of the closest places on dry land in Java where one could see the infamous Krakatau, a volcano which erupted with cataclysmic results in 1883. En route to Anyer, we passed by Cilegon, a city aptly nicknamed the "City of Steel". Cilegon is home to Krakatau Steel (after the volcano), the largest producer of steel in Indonesia. 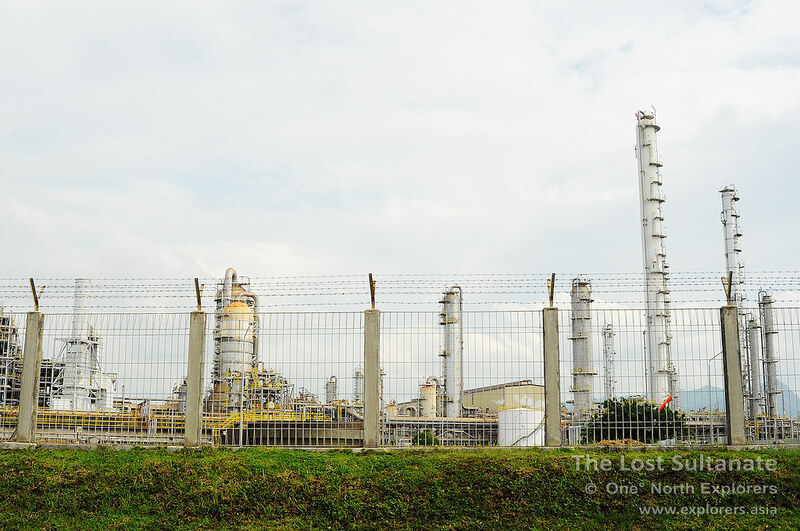 Apart from that, there were also several petrochemical refineries and cement plants in the area, giving it a real industrial feel. While traveling along the roads of Cilegon, the numerous potholes - caused by the daily activity of heavy vehicles - made the ride feel like an off road adventure. Thank goodness we finished our paper cups of hot coffee before we reached the industrial zone. On the trunk road to Anyer, we were treated with one of the biggest problems encountered by the locals in these parts - flooding. The two-lane road had been reduced to one narow strip which stayed dry. Some gung-ho motorcyclists who tried to ride through the flood waters ended up with stalled engines and had to push their bikes out of the water. As the flood water was knee-deep, virtually everyone tried to squeeze onto the dry strip, causing major congestion. After being stuck in traffic for a good hour or so, we were on our way once again. The roads outside of the industrial zone were in stark contrast to the road we traveled on earlier and the rest of the ride was mostly pleasant. Before long, I could spot coconut trees swaying in the gentle sea breeze and we soon reached a small cape which extruded out of Anyer beach. Hardi explained that he wanted to show me something interesting before we headed to the iconic lighthouse. As we planted our feet on the sandy beach, Hardi said: "Take a look at the sand." I noticed that the sand was darker than usual. Due to the beach's proximity to the active Anak Krakatau (child of Krakatau), the sand must have been mixed with volcanic soil (which is gray-black) by the current, giving it a beautiful brownish hue. Anyer Beach was an interesting place and there were all sorts of activities going on around the area. One could choose from various forms of water recreational activities, lie in the sand or even go for a horse ride along the coast. The name Krakatau itself is something of a misnomer, as the volcano does not exist anymore. When Krakatau erupted with such immense power in 1883, the extent of the damage suffered in the explosion was so great that only a small part of the original volcano was left behind. Pulau Rakata - a collapsed volcano and one of three volcanoes which formed the original Krakatau - stands as an independent island today. When Krakatau erupted, the explosion could be heard as far as 3,100 kilometres away in Perth, Australia. It is considered to be the loudest sound ever heard in modern history. The extent of the damage was horrendous. Officially, a hundred and sixty-five villages and towns were destroyed and a hunded and thirty-two were seriously damaged. The official death toll recorded by the Dutch authorities was 36,417 people though it could have been more. Many thousands more were injured by the eruption and the tsunamis that followed and two thirds of the island of Krakatau was destroyed as a result of the eruption. 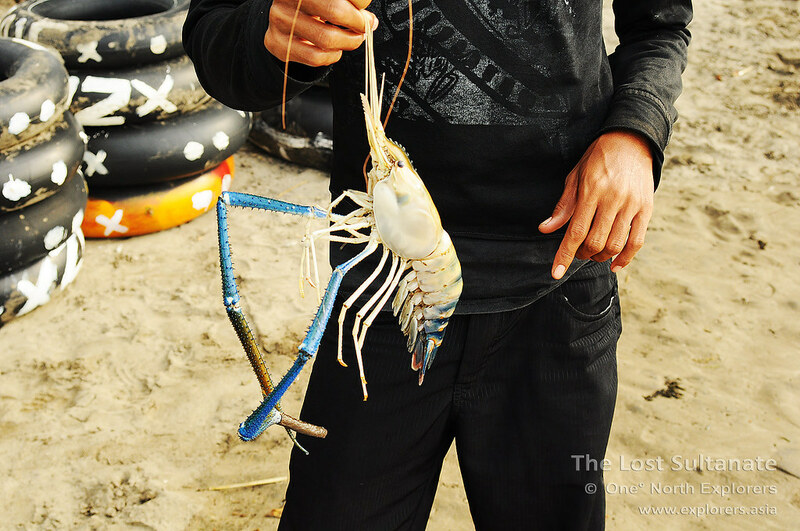 Some guy tried to sell us these monsters at Anyer Beach. Verbeek later predicted that new activity would manifest itself in the area where Krakatau once stood. This came true in December 1927 when evidence of a submarine eruption was seen in this area. A new island volcano named Anak Krakatau (Child of Krakatoa) rose above the waterline a few days later. Initially of pumice and ash, that island and the two islands that followed were quickly eroded away by the sea. However, a fourth island broke the water surface in August 1930 and produced lava that flowed faster than the waves could erode them. Anak Krakatau has been growing considerably since then and it currently has a radius of roughly 2 kilometres and it's highest point measures in at around 324 metres (1,063 ft) above sea level. The volcano is growing at a rate of five metres every year. This guy swam too hard. Sea wins, guy fails. 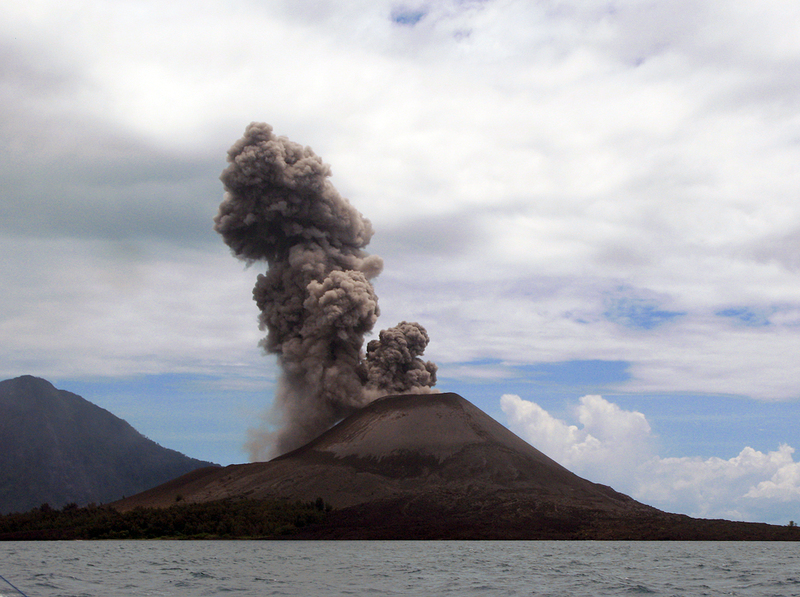 "When Krakatau erupted, it threw up a lot of rocks and lava. What I'm about to show you is a volcanic rock believed to have been thrown onto Anyer Beach by the sheer force of the explosion. "said Hardi as we strolled along the sandy beach. When we approached the aforementioned rock, I was amazed by its size. It was huge! If the story was indeed true, I could imagine the monstrous power the eruption of Krakatau had. Having said that, the eruption was about 13,000 times the nuclear yield of the Little Boy bomb that devastated Hiroshima so it was highly plausible that a piece of rock could be thrown this far across the sea. 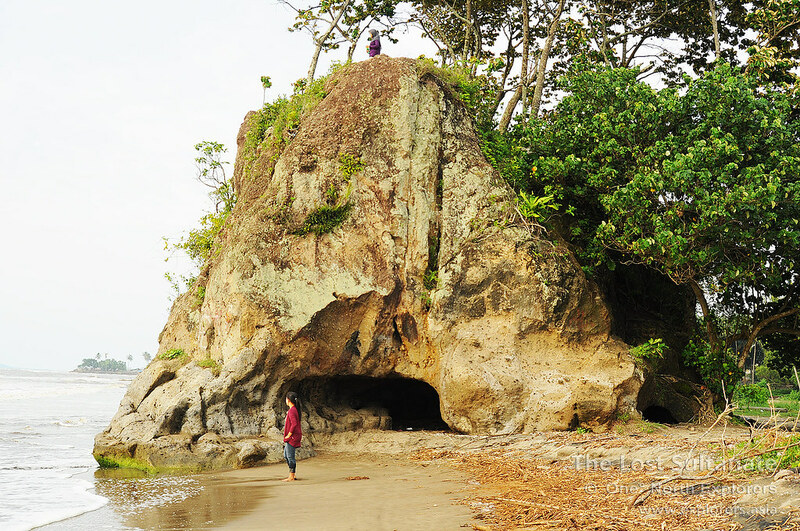 "There is a more famous rock called Karang Bolong further down the road where many tourists visit. 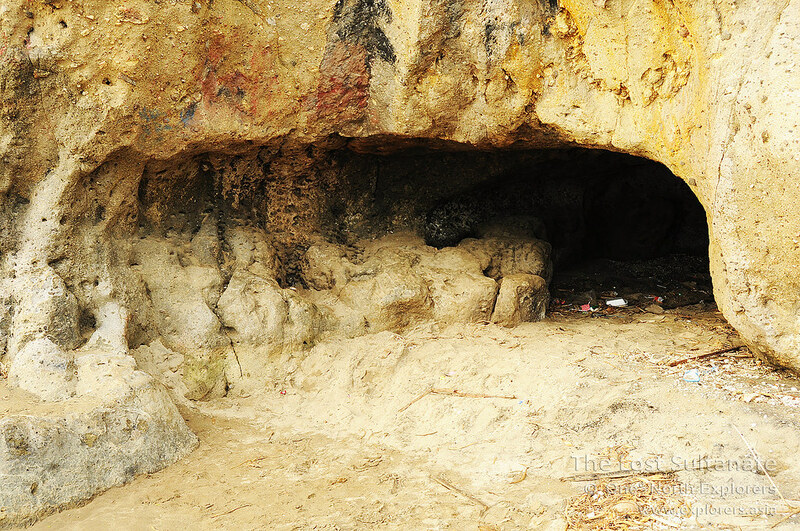 However, not many people know of this rock, which has a special cave." said Hardi as we continued towards the rock. The person next to the rock should give a good sense of scale. The rock was massive! 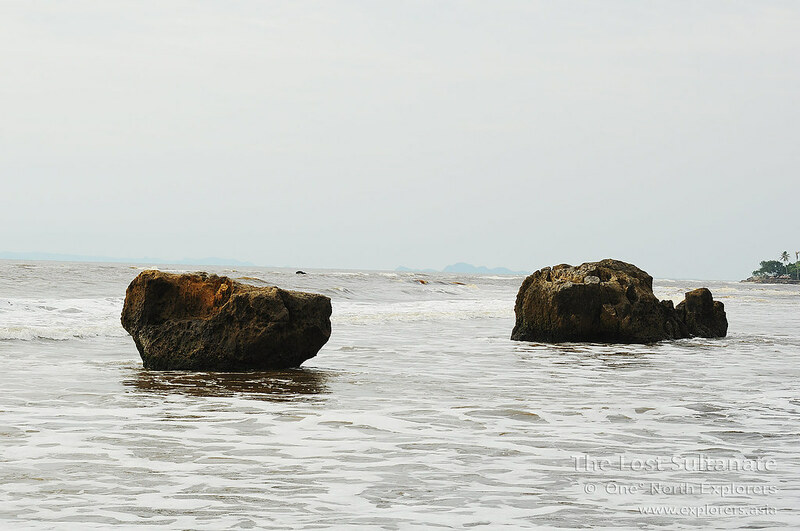 There were two smaller rocks lying in the water near to the massive rock. Although they were darker due to the innumerable barnacles and algae growing on them, they did seem to be made of the same material as the large rock. Perhaps these three rocks were thrown onto the same area during the explosion? Or the smaller rocks could have probably rolled off the larger rock due to erosion by the salty sea air? The rocks in the water reminded me of our very own Squance Rock* in Changi. As we stood at the mouth of the cave, I looked at the top part of the entrance. It seemed too perfectly flat and smooth to be natural. The height of the entrance was quite short and I had to crouch to enter the cave. Once inside, I noted that the cave itself was quite small and could only accommodate about two to three adults at any one time. It led out to a smaller opening on the other side of the rock. 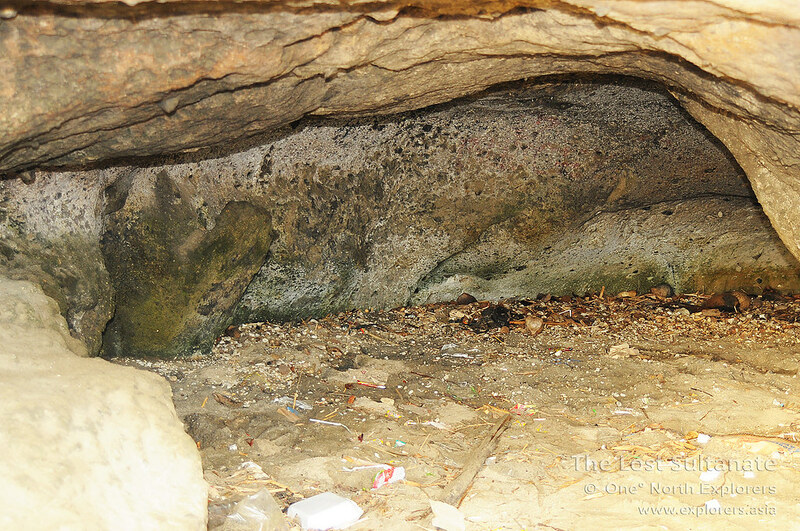 There was all kinds of rubbish strewn about the interior of the cave -food boxes, plastic bags and some other unsavouray item which I should not mention here. 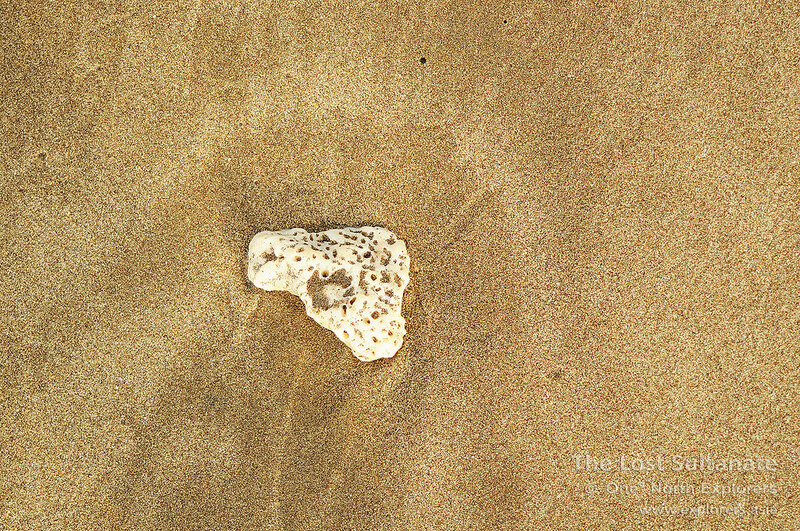 Were these brought up to shore by the gentle waves of the sea, or thrown inside by visitors? Your guess is as good as mine. 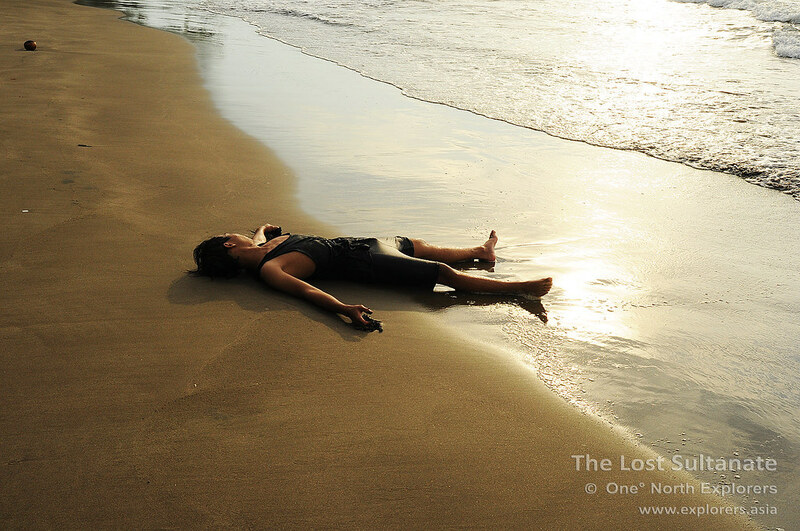 On one hand, Hardi mentioned that most of the rubbish found in Anyer is actually from Lampung province in Sumatra. With our visit to the massive volcanic rock done and dusted, we made our way to the shining beacon of Anyer Beach - the famous Anyer Lighthouse. 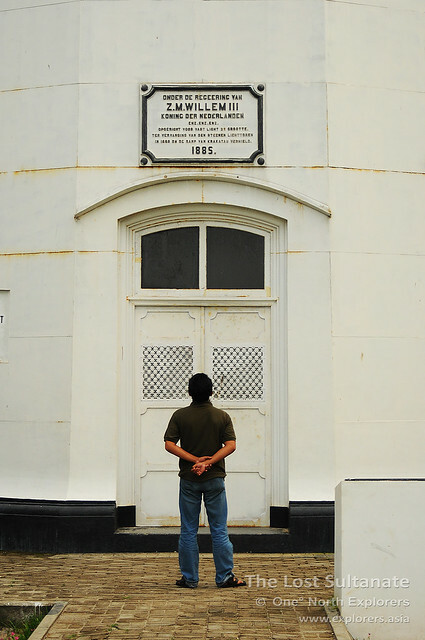 I was amazed as we arrived at the base of the lighthouse, which was more than a century old. 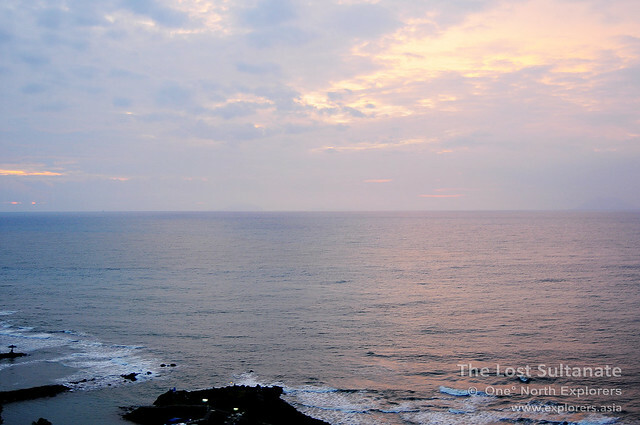 Standing tall and slender at the height of 75 metres, the gleaming white lighthouse shimmered in the face of the setting sun, a sentinel of the coast and the rich history of Anyer. After years of guarding the coast, the lighthouse looks worn and weary. 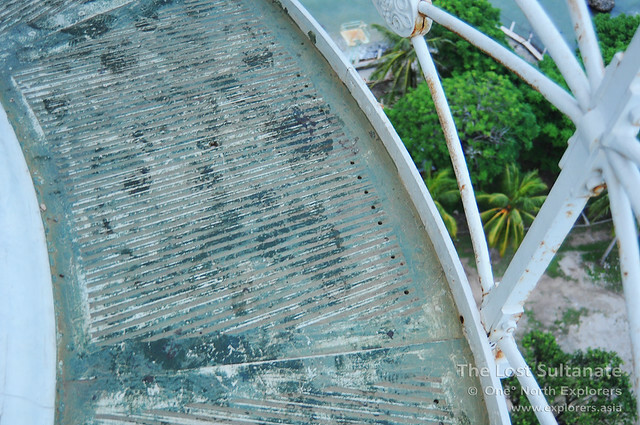 Rust can be seen in large patches on the exterior walls, a testament to the powerful effects of the corrosive sea air. An old sign, worn and torn by the sands of time. 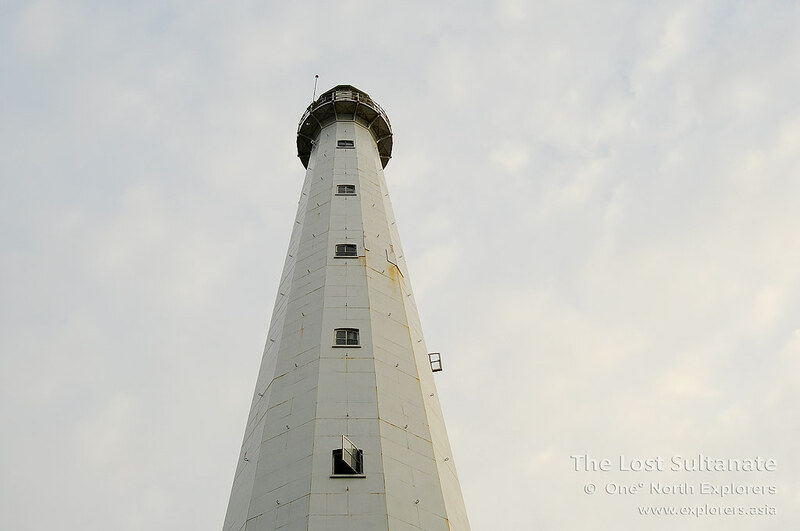 Although it seems ancient, the current lighthouse, also known as the Menara Bojong (Bojong Tower), is actually not the original lighthouse which guided and warded off ships along the Sunda Straits. 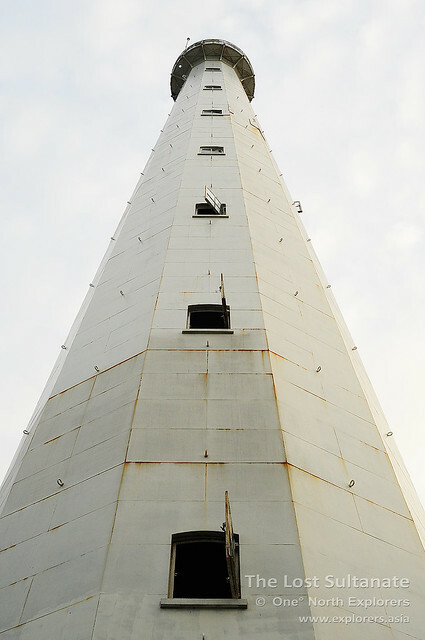 The first lighthouse was known as Fourth Point and it was part of a series of lighthouses along the coast of West Java. In 1883, Fourth Point - which stood right next to the coastline - was unfortunately destroyed by the destructive eruption of Krakatau and the tsunamis which followed suit, along with almost everything else along the coast. 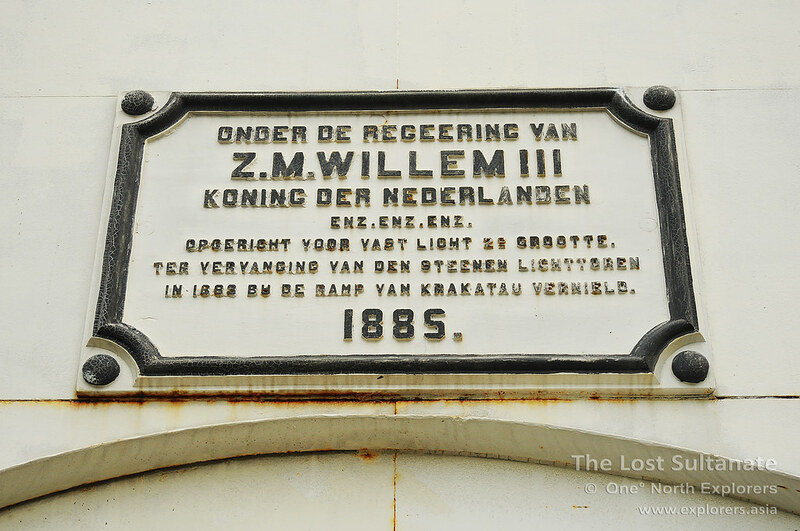 Following the annihilation of Fourth Point, a new lighthouse, named Anyer Lighthouse, was built by the Dutch a short distance from its ruins and construction on the new lighthouse was completed in 1885, a mere 2 years after Fourth Point's destruction. 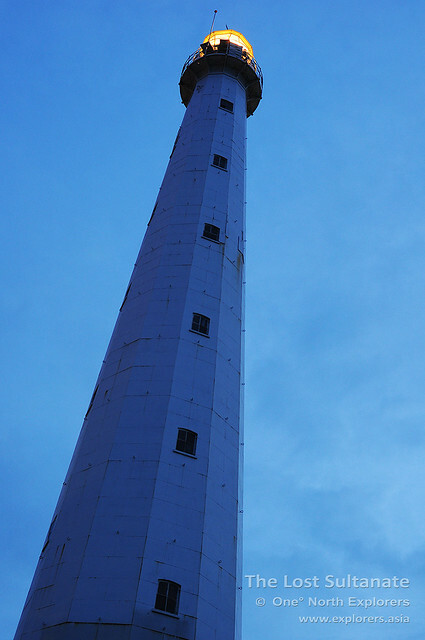 While Fourth Point was made from brick and mortar, Anyer Lighthouse was made out of pure steel, an huge improvement. 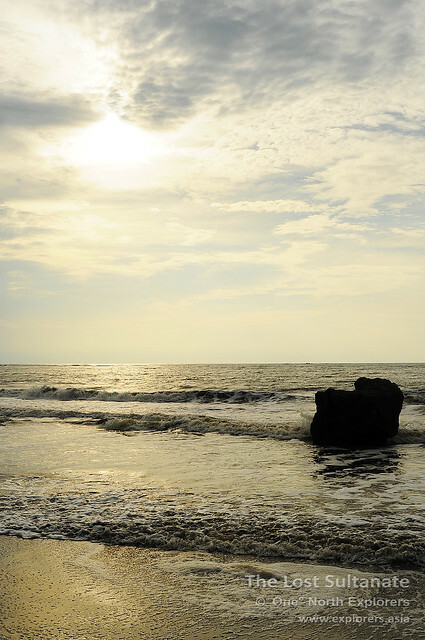 Anyer Lighthouse was also moved further inland as a preventive measure against future volcanic activity and large waves. Apart from performing its basic duty of warding off ships with its powerful beam, it also served as a memorial for the victims who perished during the eruption of Krakatau. 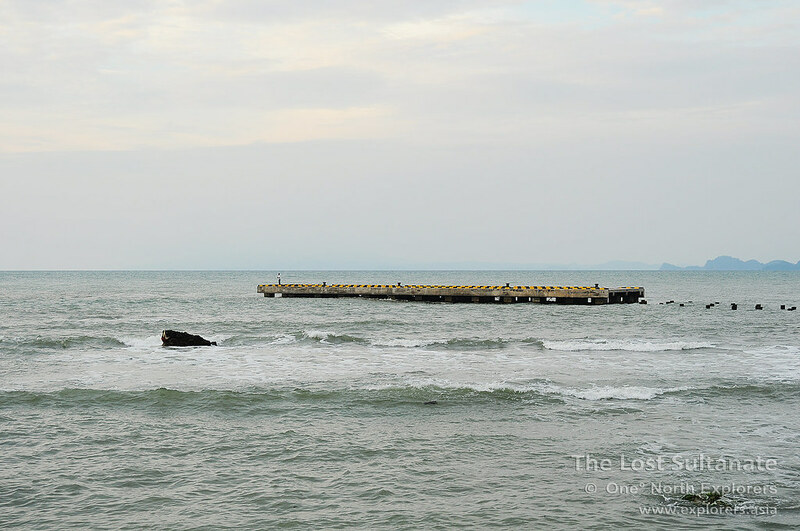 From our position at the base of the towering lighthouse, we walked over to the former location of Fourth Point. 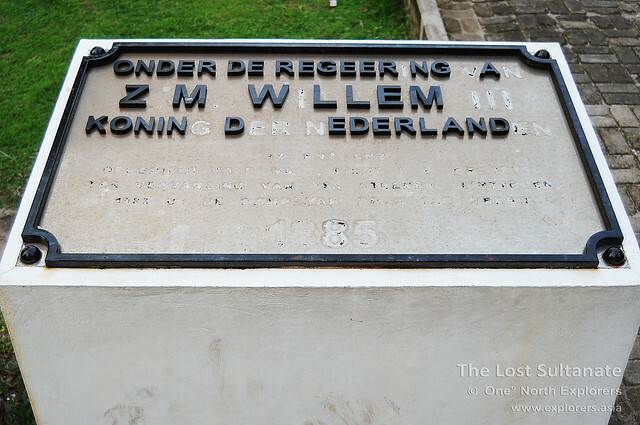 The zero kilometer marker of the Great Post Road (Der Grote Postweg) was placed right in the middle of the battered foundation of Fourth Point. 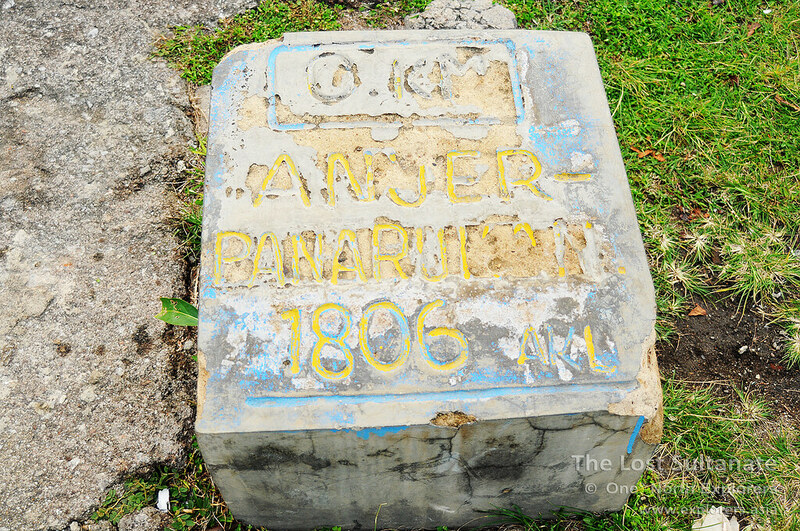 On the marker, Anyer is spelt as Anjer in the Dutch manner. 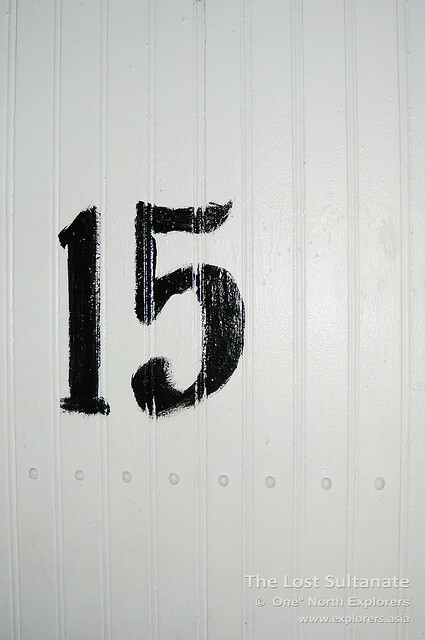 The year that the marker was created - 1806 - is also indicated clearly on the marker. 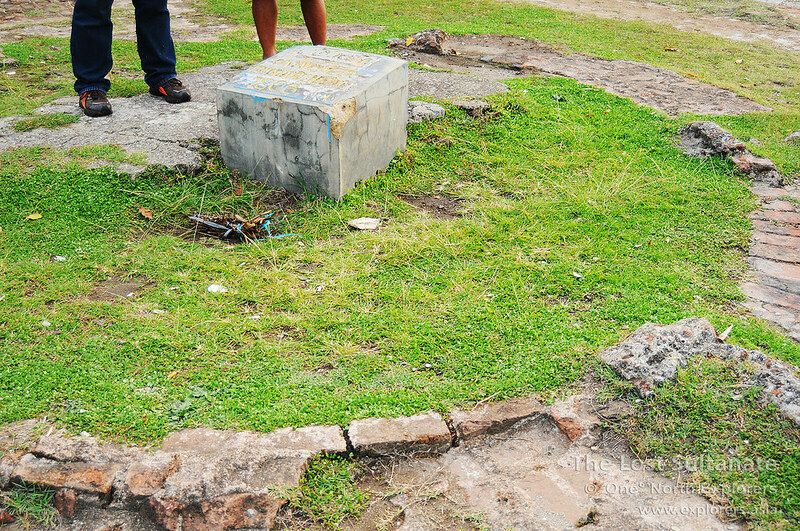 However, since Fourth Point was only destroyed in 1883, it is possible that the marker was shifted here after the events of Krakatau. 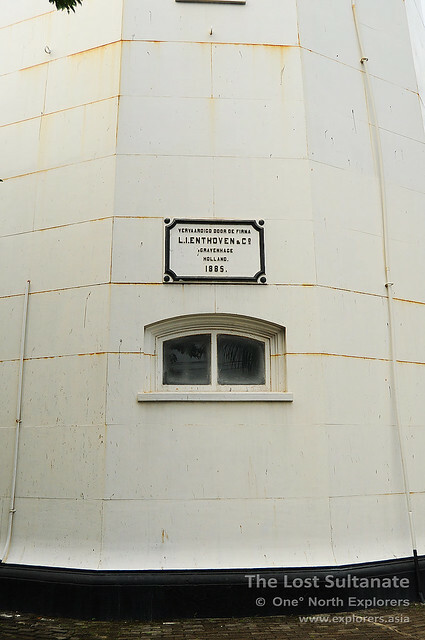 A tall lighthouse itself, Fourth Point could also have been the focal marker for Der Grote Postweg, hence the placement of the marker. "The people who worked for the Dutch during the construction of the Great Post Road were called Rodi or forced labour. They were made to work for their meals, which was mainly just plain rice, and were never paid for their efforts." Hardi poignantly recalls. The Great Post Road, which ran for 1000 kilometres from Anyer - our current location - to Panarukan in East Java, was completed in just a year through the effort of these Rodis. 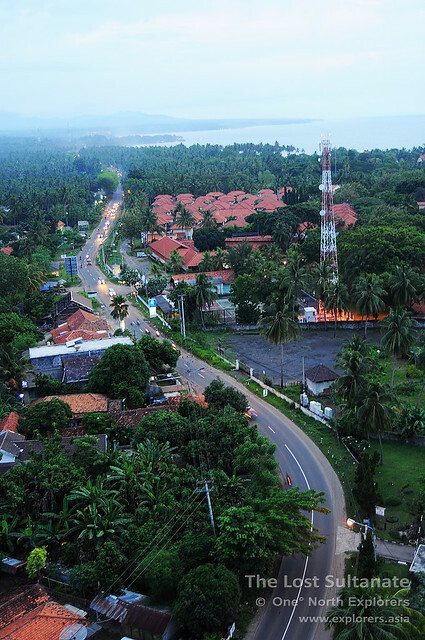 In West Java itself, traces of the road can still be found today in Banten and the city of Bandung. A stone's throw away from the Zero Kilometre Marker, a second marker can be found. 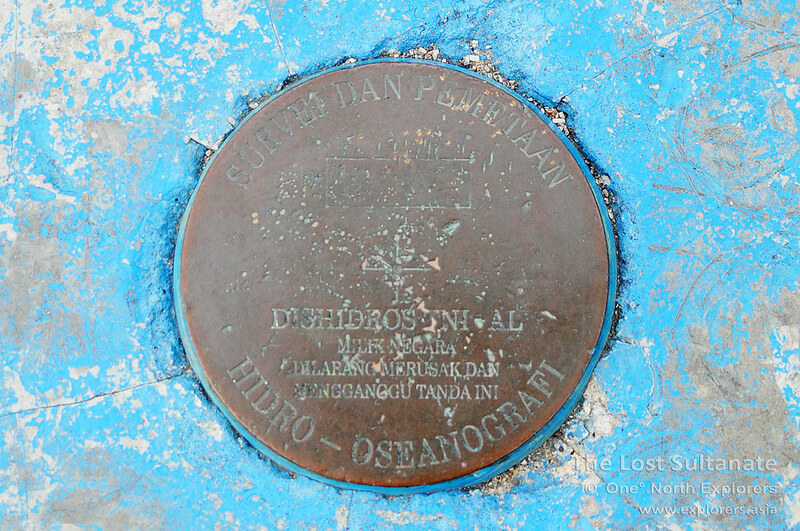 This blue stone was laid by the TNI AL's (Indonesian Navy) Office of Hydro-Oceanographical Study. Hardi turned to me as I shot the last of my photos of the marker stones. "Shall we?" 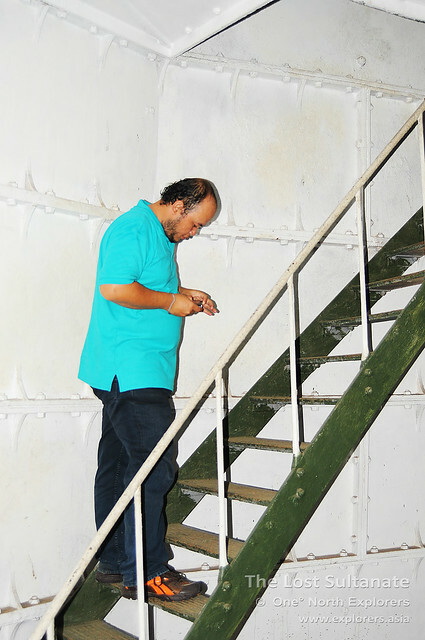 Through his arrangements, we have been given a rare chance to ascend to the top of the lighthouse. 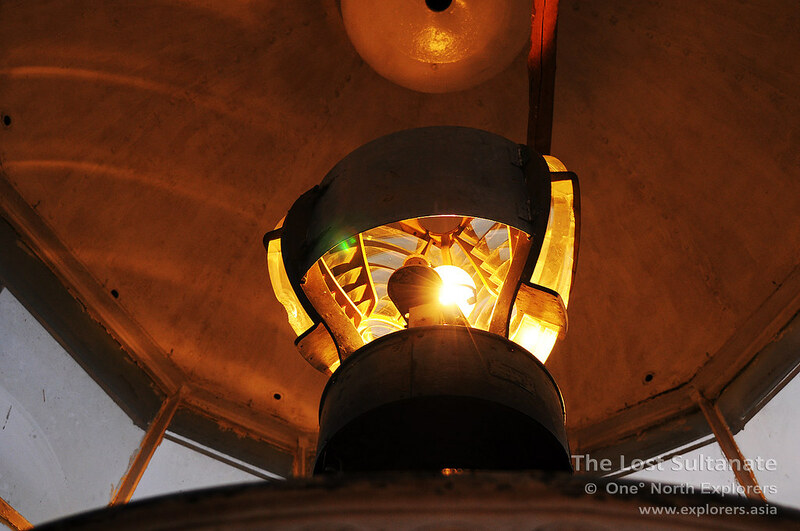 With the sun setting fast, we headed towards the lighthouse entrance, eager to see the interior of the tower and the lamp before it turned completely dark. 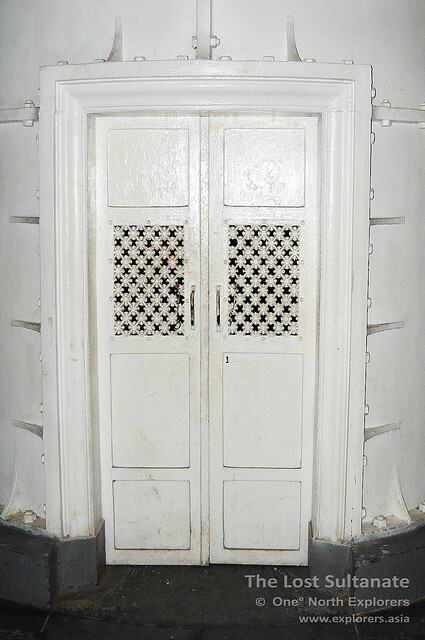 As we stepped through the rectangular doorway of the lighthouse, the first thing I noticed was a door in the middle of the central column. 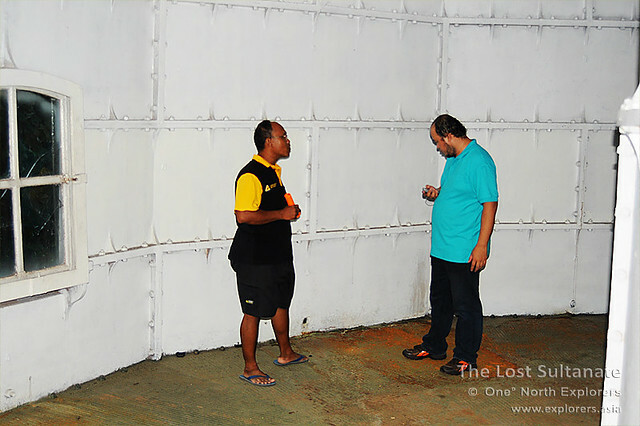 This was the former storeroom for the fuel which lit up the lamp in the old days. 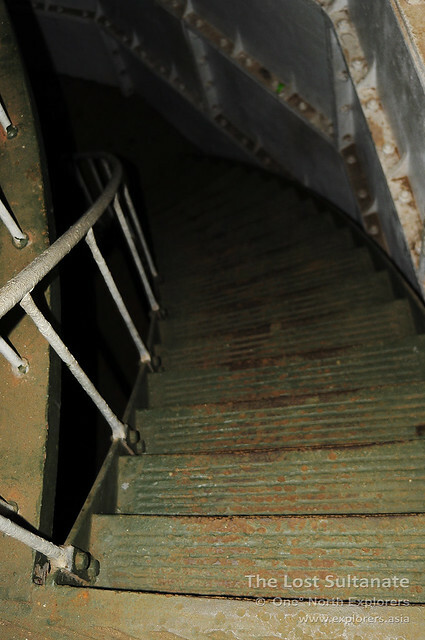 Ascending the metal staircase, I noticed whole floors that look to be severely rusted. There are 17 flights of stairs to be climbed which amounted to about 267 steps in total. Each floor had a window that allowed us to peek through for a nice view of the sea. We arrived at level 6 of the lighthouse when I started feeling uncomfortable. There seemed to something watching us from the deep dark recesses of the room. I took a few shots but they all turned out blur and out of focus no mater how hard I tried to adjust my lens. This was also when I caught a whiff of something rotten. It was a really bad odour. I took my compass out of my pocket, half expecting to find the needle spinning around wildly. Nope, it wasn't. "You smell that?" I asked Hardi. "Yes, I do." We stood there for a while. Nothing. After a short while, the smell was gone. Eager to push on to the top to catch the sunset, we continued on our ascent. The lighthouse keeper, who had gone ahead of us to the next floor, came back down and asked if everything was alright. We explained what he had just experienced, to which he replied "This is a old lighthouse. That's actually quite normal. I just ask them to leave me alone as I am working and they usually do." Hardi stops to take a breather and check his shots. 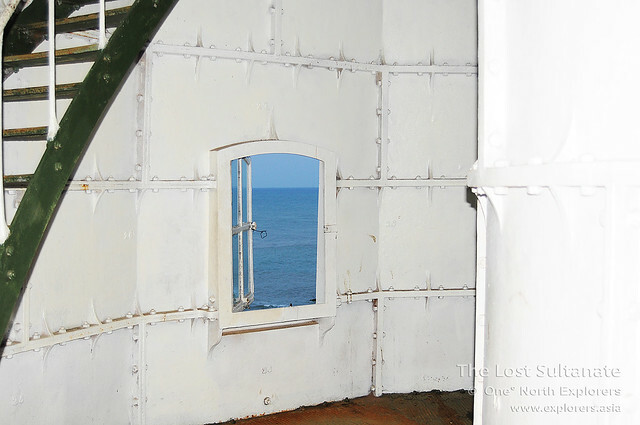 There were also numerous small holes in the walls and ceiling of the lighthouse, which we found on almost every floor. 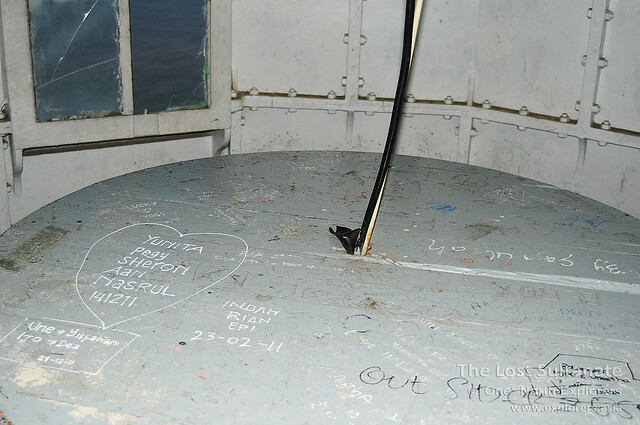 The lighthouse keeper explained that these holes were caused by gunfire. 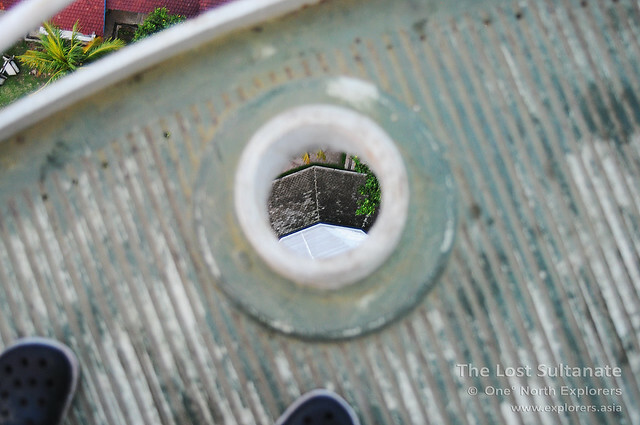 He claimed that during the Japanese occupation, Japanese soldiers would take prisoners into the lighthouse to be shot. 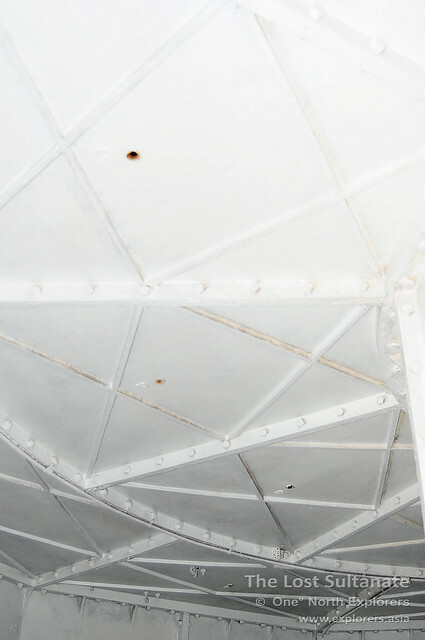 "Bullet holes" in the ceiling created by trigger-happy Japanese soldiers? It was clear that the lighthouse was quite solid judging from the many numbered plates that are joined together to form the walls, but the floors are badly rusted. The rusting in some parts of the floor seemed so bad that it looked in danger of collapsing anytime. 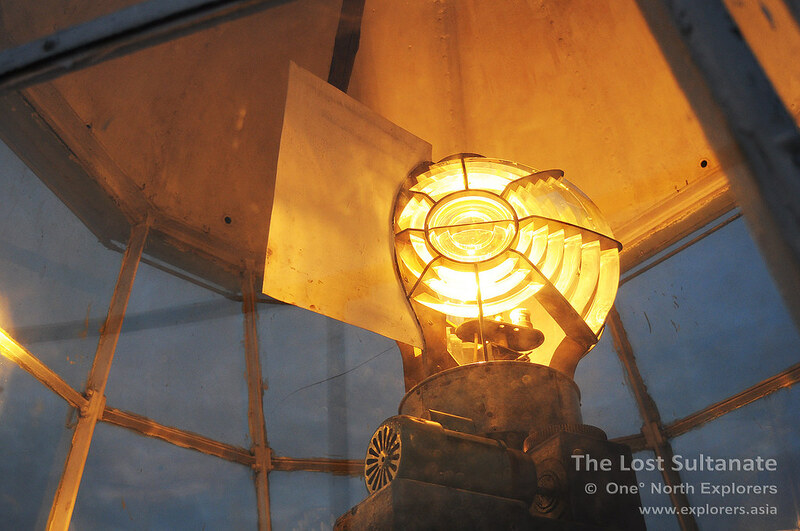 As we approached the top of the lighthouse, we could hear the gentle whirring of the lamp shade revolving around. We arrived at the room just below the top floor and found it to be of a unique design. 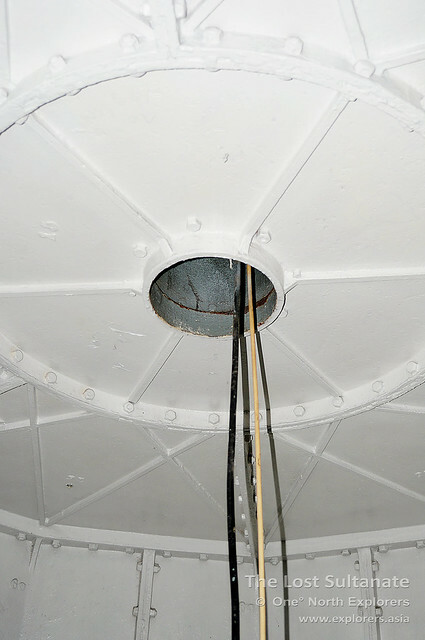 There were wires hanging from a hole in the ceiling (which leads to the lamp itself) and these were connected to the middle of a round drum placed in the centre of the round room. The drum had taken up almost all the space on the floor, leaving only the stairwell as the only place where one could walk. Sadly, the drum was badly vandalised as you can see from the pictures above. In the old days, the room was home to a large discus which supplied fuel to the wick of the lamp above. Technology has since taken over and the lamp is now powered by electricity in the present day. Heading up the final flight of stairs, I finally the first rays of light from the lighthouse lamp as I emerged from the stairwell. 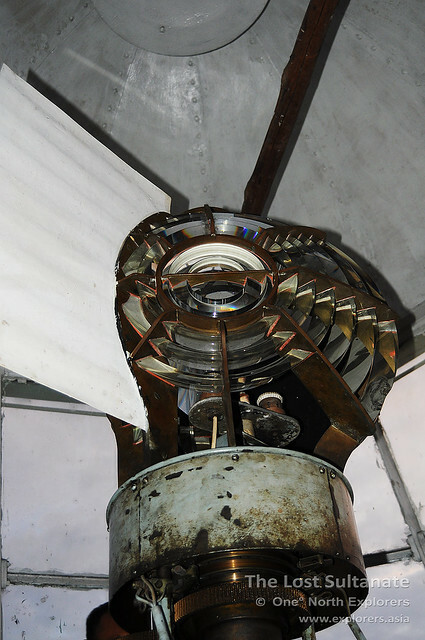 The bright bulb was enclosed in a fresnel lens, which helped to amplify the waves of light to reach great distances across the sea. It was fascinating to see the lamp us close for myself. I took a couple of pictures, some from within the lamp room, and some from the galley outside. The shots from the exterior of the lamp room look much grubbier as the lamp room's glass windows looked like they have not been cleaned for years. But then again, it could have been a combination of the sea breeze and volcanic ash from nearby Anak Krakatau which caused the window to be so dusty. I quickly whipped out my camera to get this shot. Who would have thought that such a seemingly small contraption could save so many lives at sea by projecting light beams for miles around the lighthouse? After the interesting lamp room, it was time for us to head out to the galley outside. The breeze was pretty strong out here, and the height of the galley made the walk a little more intimidating, but the excellent view of the setting sun more than made up for the unnerving experience. 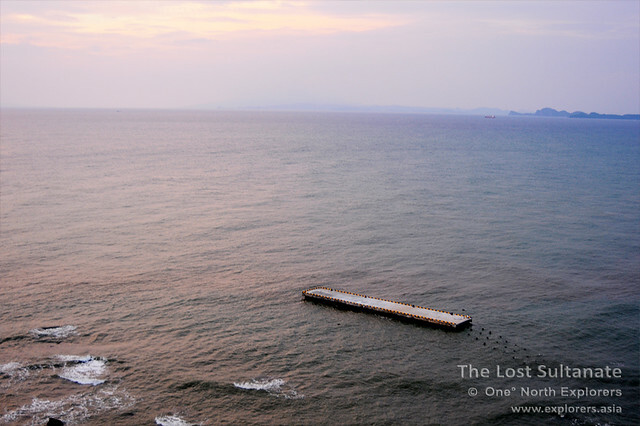 Sunset over the Sunda Straits, as seen from the top of Anyer Lighthouse. Bakau, the southernmost tip of Sumatra, can be seen to the right of the picture. The galley walkway was rather narrow, and it felt a little jittery at times. 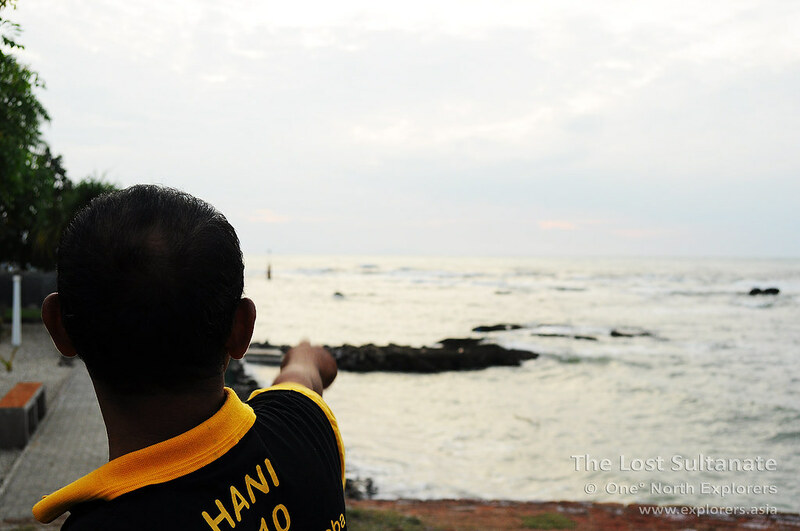 From here, we could look out to Merak Port in the north and Sumatra in the northwest. The view was simply breathtaking. As I made my way around the galley, I noticed an unusual hole in one part of the walkway. You could see right through the hole to the ground floor. Perhaps this was a drainage outlet for the galley? Well, I guess he was right. The steps were narrow and steep, and descending 17 flights of stairs in the dark was much harder than expected. Even with our torches, we had to descend slowly due to the steep incline of the staircase. Before long, Hardi and I were back on level ground. 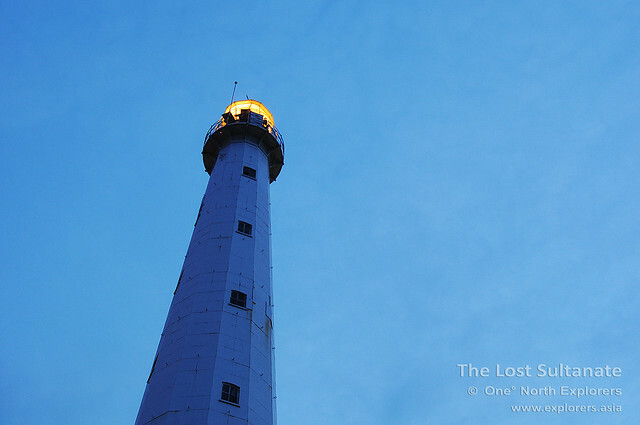 I turned around and took a few more pictures of the lighthouse, now basked in the last glimpses of sunlight against the dark-blue sky. The setting sun was a befitting end to my little trip to beautiful Banten. It had been an amazing day for me, visiting the remnants of the lost Sultanate, exploring the palace ruins, the complex water filtration system, the marker for Der Grote Postweg and the amazing Anyer Lighthouse with the wonderful company of Hardi. I hope that these fragile pieces of history are not lost and forgotten over time. Surosowan Palace has already fallen victim to the unforgiving effects of time, and i hope that this does not erode into the other relics of the past which Banten has in abundance. Afterall, Bantam was a great Sultanate which started off the spread of Islam in Indonesia. The future generations should be reminded of its achievements for years to come - not just in textbooks - but in person; field trips organized to Banten and Anyer should be a good start. This part of Indonesia's history is just too precious to fade away just like that.